If you wear braces, you are vulnerable to two types of dental emergency situations. The first is a direct tooth or mouth injury, and the second is an unexpected problem with your orthodontic appliance. If you experience a blow to your jaw, a knocked-out tooth, or a serious mouth injury, call an emergency dentist immediately for advice, or go to the nearest hospital emergency room. X-rays may be needed. For non-urgent problems like loose, broken, or otherwise malfunctioning braces, notify your orthodontist and obtain advice. Wires that poke the inside of cheeks can be clipped. Do not attempt this on your own; call your orthodontist for telephone assistance. To manage loose bands or brackets, call for a dental appointment. If parts come off, take them with you to the orthodontist. Bent headgear, a broken archwire, or a badly fitting removable appliance require professional adjustment. See your orthodontist. To stop irritation from wires or brackets, cover them with orthodontic wax. 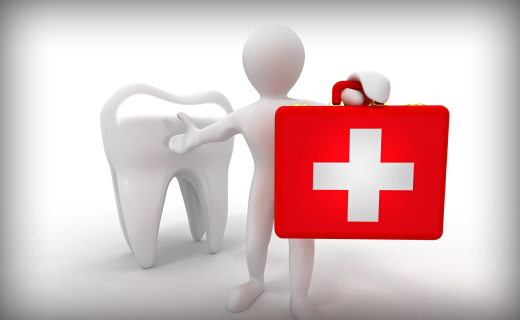 Should an orthodontic dental emergency occur, it’s wise to be familiar with the various parts of your appliance so you can clearly explain what happened to emergency dentists or orthodontists. Following are definitions for each part of your appliance. Braces are the small brackets bonded to each of your teeth. Archwires are the thin continuous wires that are attached to your brackets. A or P chain refers to the collection of colored elastic ligatures that connect all the braces and wires. Bands are the metal rings placed around your back teeth to anchor archwires and attach neckgear. Springs are the small coils that are used to close spaces. Crowns are caps made from stainless steel; they are fitted onto your molars for the Herbst orthodontic appliance. Retainers are made from plastic or acrylic and wire; they are removable devices that help hold your teeth in the finishing position. Permanent retainers are cemented into place.